I have been revisiting estimates of the quantities of gold being absorbed by China, and yet again I have had to revise them upwards. Analysis of the detail discovered in historic information in the context of China's gold strategy has allowed me for the first time to make reasonable estimates of vaulted gold, comprised of gold accounts at commercial banks, mine output and scrap. There is also compelling evidence mine output and scrap are being accumulated by the government in its own vaults, and not being delivered to satisfy public demand. The impact of these revelations on estimates of total identified demand and the drain on bullion stocks from outside China is likely to be dramatic, but confirms what some of us have suspected but been unable to prove. Western analysts have always lagged in their understanding of Chinese demand and there is now evidence China is deliberately concealing the scale of it from us. Instead, China is happy to let us accept the lower estimates of western analysts, which by identifying gold demand from the retail end of the supply chain give significantly lower figures. Before 2012 the Shanghai Gold Exchange was keen to advertise its ambitions to become a major gold trading hub. 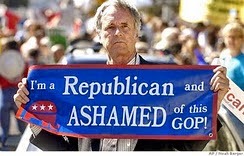 This is no longer the case. 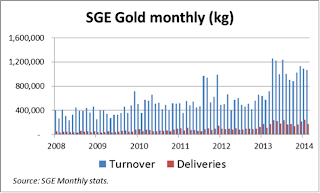 The last SGE Annual Report in English was for 2010, and the last Gold Market Report was for 2011. 2013 was a watershed year. Following the Cyprus debacle, western central banks, seemingly unaware of latent Chinese demand embarked on a policy of supplying large quantities of bullion to break the bull market and suppress the price. The resulting expansion in both global and Chinese demand was so rapid that analysts in western capital markets have been caught unawares. I started following China's gold strategy over two years ago and was more or less on my own, having been tipped off by a contact that the Chinese government had already accumulated large amounts of gold before actively promoting gold ownership for private individuals. I took the view that the Chinese government acted for good reasons and that it is a mistake to ignore their actions, particularly when gold is involved. Since then, Koos Jansen of ingoldwetrust.ch has taken a specialised interest in the SGE and Hong Kong's trade statistics, and his dedication to the issue has helped spread interest and knowledge in the subject. He has been particularly successful in broadcasting market statistics published in Chinese to a western audience, overcoming the lack of information available in English. • China knew at the outset that gold is the west's weak spot, with actual monetary reserves massively overstated. For all I know their intelligence services may have had an accurate assessment of how much gold there is left in western vaults, and if they had not, their allies, the Russians, probably did. Representatives of the People's Bank of China will have attended meetings at the Bank for International Settlements where these issues are presumably openly discussed by central bankers. • China has significant currency surpluses under US control. By controlling the gold market China can flip value from US Treasuries into gold as and when it wishes. This gives China ultimate financial leverage over the west if required. • By encouraging its population to invest in gold China reduces the need to acquire dollars to control the renminbi/dollar rate. Put another way, gold purchases by the public have helped absorb her trade surplus. Furthermore gold ownership insulates her middle classes from external currency instability which has become an increasing concern since the Lehman crisis. For its geopolitical strategy to work China must accumulate large quantities of bullion. To this end China has encouraged mine production, making the country the largest producer in the world. It must also have control over the global market for physical gold, and by rapidly developing the SGE and its sister the Shanghai Gold Futures Exchange the groundwork has been completed. If western markets, starved of physical metal, are forced at a future date to declare force majeure when settlements fail, the SGE and SGFE will be in a position to become the world's market for gold. Interestingly, Arab holders have recently been recasting some of their old gold holdings from the LBMA's 400 ounce 995 standard into the Chinese one kilo 9999 standard, which insures them against this potential risk. China appears in a few years to have achieved dominance of the physical gold market. Since January 2008 turnover on the SGE has increased from a quarterly average of 362 tonnes per month to 1,100 tonnes, and deliveries from 44 tonnes per month to 212 tonnes. It is noticeable how activity increased rapidly from April 2013, in the wake of the dramatic fall in the gold price. From January 2008, the SGE has delivered from its vaults into public hands a total of 6,776 tonnes. This is illustrated in the chart below. This is only part of the story, the part that is in the public domain. In addition there is gold imported through Hong Kong and fabricated for the Chinese retail market bypassing the SGE, changes of stock levels within the SGE's network of vaults, the destination of domestic mine output and scrap, government purchases of gold in London and elsewhere, and purchases stored abroad by the wealthy. Furthermore the Chinese diaspora throughout South East Asia competes with China for global gold stocks, and its demand is in addition to that of China's Mainland and Hong Kong. The SGE, which is the government-owned and controlled gold exchange monopoly, runs a vaulting system with which westerners will be familiar. Gold in the vaults is fungible, but when it leaves the SGE's vaults it is no longer so, and in order to re-enter them it is treated as scrap and recast. In 2011 there were 49 vaults in the SGE's system, and bars and ingots are supplied to SGE specifications by a number of foreign and Chinese refiners. Besides commercial banks, SGE members include refiners, jewellery manufacturers, mines, and investment companies. The SGE's 2010 Annual Report, the last published in English, states there were 25 commercial banks included in 163 members of the exchange, 6,751 institutional clients accounting for 81% of gold traded, and 1,778,500 clients of the commercial banks with gold accounts. The 2011 Gold Report, the most recent available, stated that the number of commercial bank members had increased to 29 with 2,353,600 clients, and given the rapid expansion of demand since, the number of gold account holders is likely to be considerably greater today. 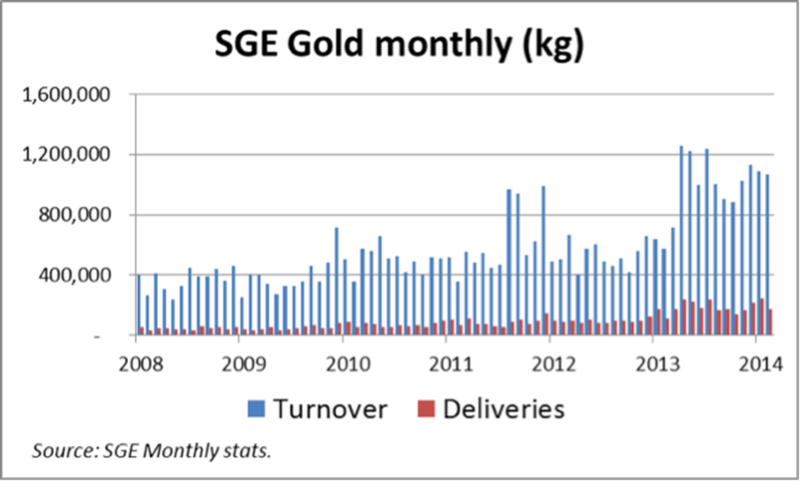 About 75% of the SGE's gold turnover is for forward settlement and the balance is for spot delivery. Standard bars are Au99.95 3 kilos (roughly 100 ounces), Au99.99 1 kilo, Au100g and Au50g. The institutional standard has become Au99.99 1 kilo bars, most of which are sourced from Swiss refiners, with the old Au99.95 standard less than 15% of turnover today compared with 65% five years ago. The smaller 100g and 50g bars are generally for retail demand and a very small proportion of the total traded. Public demand for smaller bars is satisfied mainly through branded products provided by commercial banks and other retail entities instead of from SGE-authorised refiners. Overall volumes on the SGE are a tiny fraction of those recorded in London, and the market is relatively illiquid, so much so that opportunities for price arbitrage are often apparent rather than real. The obvious difference between the two markets is the large amounts of gold delivered to China's public. This has fuelled the rapid growth of the Chinese market leading to a parallel increase in vaulted bullion stocks, which for 2013 is likely to have been substantial. By way of contrast the LBMA is not a regulated market but is overseen by the Bank of England, while the SGE is both controlled and regulated by the People's Bank of China. The PBOC is also a member of both its own exchange and of the LBMA, and deals actively in non-monetary gold. While the LBMA is at arm's length from the BoE, the SGE is effectively a department of the PBOC. This allows the Chinese government to control the gold market for its own strategic objectives.